HOLLYWOOD, CA -- Throughout the course of ''Waiting for Superman,'' the new documentary directed by Davis Guggenheim (''An Inconvenient Truth''), viewers are taken on emotional rollercoaster courtesy of the heart-wrenching case histories of five different families across the country struggling to give their kids a shot at a better education. When it came to the main-on-end title sequence though, Guggenheim entrusted yU+co., the design/visual effects studio led by Founder/Creative Director Garson Yu, to leave the audience with just one lasting impression: hope. Following on the heels of their successful collaboration on the Academy Award-winning ''An Inconvenient Truth'' (2006), the ''Waiting For Superman'' titles feature a gracefully moving string of connective typography underscored by a series of animated blue lines. Set to the powerful track ''Shine'' by John Legend, key title credits are interwoven with an impassioned cry for help: ''Our system is broken and it feels impossible to fix, but we can’t wait. Text ‘possible’ to 77177,'' the typography reads. As the titles progress so do the complexity of the animated blue lines. The sequence builds toward a breathtaking and unexpected payoff with the final on-screen type: ''Great schools won’t come from winning the lottery. They won’t come from Superman. They will come from you.'' The last word ‘you’ fades slowly into the background as the camera swiftly pans backward and quickly skyward. 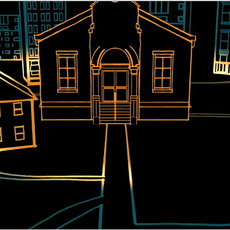 A golden shaft of light reveals that the blue lines seen throughout have formed a large, 3D animated blueprint of a school and a community connected to it. In addition to their work on ''Waiting for Superman,'' yU+co. also completed work on the titles for the Warner Bros. romantic comedy ''Life As We Know It'' and for the second year in a row created the full graphics package for NBC’s recent broadcast of the 62nd Annual Emmy Awards. In addition, they created the open for the live event launch conference of LG’s Optimus smartphones. Recognized as an industry leader in visual design and motion graphics with offices in Hollywood, Hong Kong, and Shanghai, yU+co. (www.yuco.com) specializes in main and end titles for film and television, visual effects, TV show opens and network graphics packages, theatrical logos, game cinematics and commercials. For more information contact Director of Business Development Dianna Costello (323-606-5050, dianna@yuco.com).